Sidney Post 217’s Dan Kearns pitches against Van Wert Post 178 during an American Legion tournament game on Wednesday at Custenborder Field. 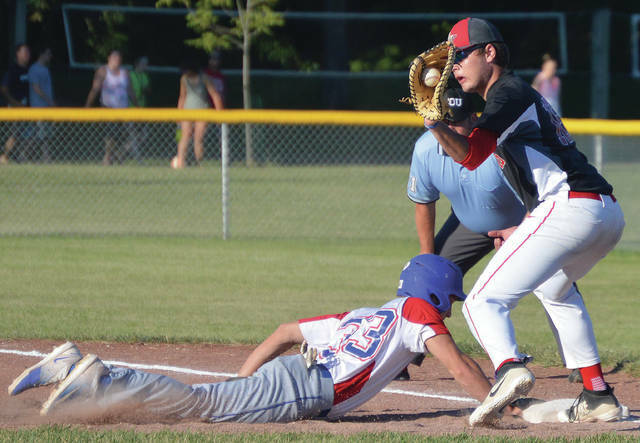 Sidney Post 217’s Dion Puthoff dives back to first as Van Wert’s Tristen Wehner tries to pick him off during an American Legion tournament game on Wednesday at Custenborder Field. 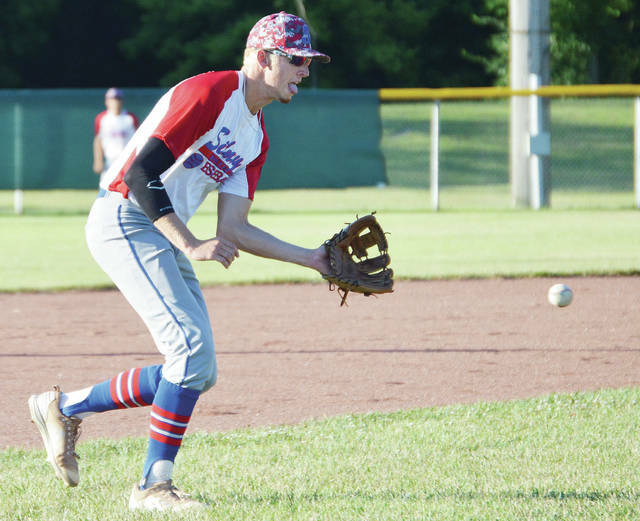 Sidney Post 217’s Darren Hoying is unable to avoid Van Wert’s Jaden Youtsey at third base during an American Legion tournament game on Wednesday at Custenborder Field. Sidney Post 217’s Darren Hoying tags Van Wert’s TJ Reynolds at home after the ball pops out of his glove during an American Legion tournament game on Wednesday at Custenborder Field. 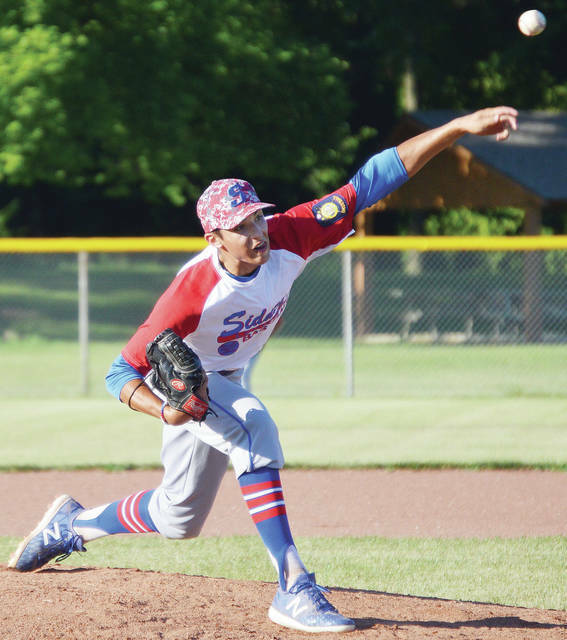 SIDNEY — Sidney Post 217 had a bad start in an American Legion tournament game on Wednesday and fell short in its bid for a third consecutive state berth. But with most players eligible to return next year, coach Daulton Mosbarger says the program is in a position to compete for a state berth next year. Van Wert Post 178 scored five runs in the first inning to spark an 8-0 win over Sidney in a Region 2 tournament game. The loss eliminated Post 217 (19-15) from the tournament. 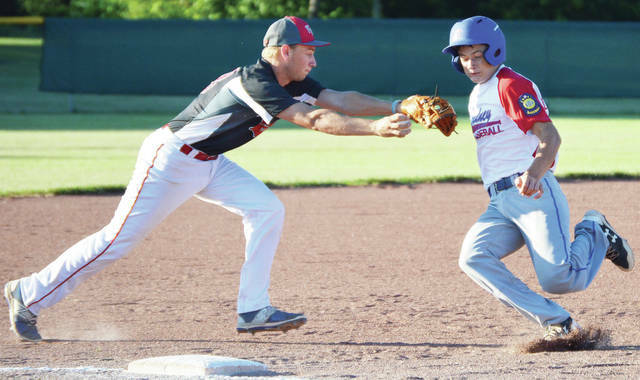 Sidney won the Western Ohio League for the third consecutive season — in part thanks to two one-run wins over Van Wert in regular-season play. The squad was presented with the WOL championship trophy after Wednesday’s loss. Sidney managed three hits against Van Wert Post 178 starter Gavin Carter. Carter threw a complete game and had nine strikeouts with one walk. Post 217 starting pitcher Dan Kearns, who threw a complete-game shutout against Greenville last week, allowed five runs on six hits in the top of the first inning. After Alex Schneider flied out to right field, TJ Reynolds hit a single to shallow right field, Caleb Fetzer hit a double to center field and Jon Lee hit a single to center field that scored a run and put Post 178 up 1-0. Reid Spencer then hit a grounder up the middle that scored two runs and Jaden Youtsey followed with a two-run home run over the center-field fence to push the lead to 5-0. Spencer hit an RBI single in the fifth, after which Sidney brought in Evan Monnier to pitch in relief. Van Wert scored two runs on a ground out and passed ball before the end of the inning to push the lead to 8-0. Post 217 didn’t have a base runner in the last three innings. Post 178 had 11 hits. Lee was 3 for 3 with 1 RBI for Van Wert, Spencer was 2 for 3 with 3 RBIs and Youtsey was 2 for 3 with 2 RBIs. Dion Puthoff, Tyler Louden and Hunter Cohee hit singles for Post 217. Mosbarger, a Bellefontaine and Ohio State grad, is in his first season as the program’s coach and plans to return next year. He is an assistant coach at Urbana University. “There is a lot of guys that are just great guys to hang out with,” Mosbarger said of the squad. “Great energy — that’s always been good all summer. It’s light and it’s never been a bad day to come to the ball park with these guys. Most of the squad’s roster will be eligible to return to the 19-and-under program next season, including six of the players in the lineup on Wednesday. 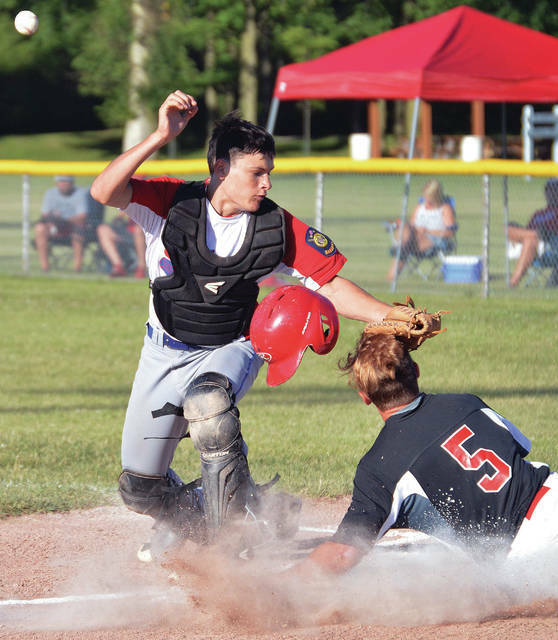 This entry was tagged American Legion, Baseball, Caleb Fetzer, Custenborder Field, Dan Kearns, Daniel Kearns, Daulton Mosbarger, Dion Puthoff, district, Evan Monnier, Gavin Carter, Hunter Cohee, Jaden Yutsey, Jon Lee, Lancaster, Legion, ohio, pics, picture, pictures, playoff, Post 178, Post 217, Postseason, record, region, region 2, regional, Reid Spencer, score, Sidney, Sidney Post 217, state tournament, TJ Reynolds, Tournament, tourney, Tyler Louden, Van Wert, Van Wert Post 178, Veterans Memorial Field, Zach Griesdorn. Bookmark the permalink.